The 57th Annual Grammy Awards was once again held at the Staples Center in Los Angeles. 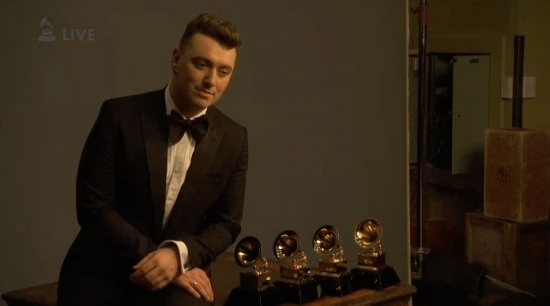 Sam Smith was the big winner on the night, taking home 4 golden gramophone trophies. See winners below. AC/DC opened the show with "Rock or Bust" before diving into "Highway to Hell." The crowd joined in with light-up devil horns handed out all to props. LL Cool J hosted the night and was short and sweet in his intro. Taylor Swift started off the night by presenting the Best New Artist award to Sam Smith. Ariana Grande performed the ballad "Just a Little Bit of Your Heart" accompanied by piano and strings, showing off her vocal range. Tom Jones & Jessie J did a duet of "You've Lost that Lovin' Feelin'" before handing out the Best Pop Solo Performance to Pharrell for "Happy." Miranda Lambert put on an explosive performance of "Little Red Wagon." Barry Gibb and Pentatonix presented Best Pop Vocal Album to Sam Smith for In the Lonely Hour. Kanye West performed "Only One" for the first time. It featured him standing over a single spotlight. Usual rockers Adam Levine & Gwen Stefani donned formal wear and were backed by full string section to duet on the ballad “My Heart is Open.” Annie Lennox and Hozier collaborated on his hit “Take Me to Church” before sliding into Screamin' Jay Hawkins “I Put a Spell of You.” Nick Jonas & Meghan Trainor give away Best Country Album to Miranda Lambert for Platinum. Katy Perry sang “By The Grace of God” with a simple white back drop, wearing a white dress, with lyrical shadow dancers behind her. The performance was dedicated to domestic violence awareness. Tony Bennett & Lady Gaga teamed up on stage to sing the Irving Berlin standard “Cheek to Cheek” off their Grammy award winning album of the same name. It won Best Tradional Pop Vocal Album. Usher sang Stevie Wonder's “If It's Magic.” He was joined by the Motown great on harmonica right at the end to a standard. Eric Church played “Give Me Back My Hometown” and Brandy Church & Dwight Yokum played “Hold My Hand” for the perfunctory Country portion of the show. With the depth and breadth of Country music today I think they could have found better songs by more entertaining artists to showcase the format. Rihanna, Kanye West, Paul McCartney performed their brand new single “FourFiveSeconds”. Rihanna and Kanye traded vocals as Paul played acoustic guitar. This was the first time they have performed this song live. It is expected to appear on Rihanna's upcoming album. LL Cool J and Gweneth Paltrow introduced Beyonce. She sang the gospel song “Precious Lord, Take My Hand” from the movie Selma in what appeared to be a wedding dress/white gown or robe surrounded by men in white suits. To end the show, John Legend & Common followed with the powerful “Glory,” also from the film. POP SOLO PERFORMANCE: "Happy (Live)," Pharrell Williams. POP DUO/GROUP PERFORMANCE: "Say Something," A Great Big World and Christina Aguilera. TRADITIONAL POP VOCAL ALBUM: "Cheek to Cheek," Lady Gaga and Tony Bennett. ROCK ALBUM: "Morning Phase," Beck. ROCK PERFORMANCE: "Lazaretto," Jack White. ROCK SONG: "Ain't It Fun," Hayley Williams and Taylor York. COUNTRY ALBUM: "Platinum," Miranda Lambert. COUNTRY SOLO PERFORMANCE: "Something in the Water," Carrie Underwood. COUNTRY DUO/GROUP PERFORMANCE: "Gentle on My Mind," The Band Perry. COUNTRY SONG: "I'm Not Gonna Miss You," Glen Campbell. RAP ALBUM: "The Marshall Mathers LP2," Eminem. RAP PERFORMANCE: "i," Kendrick Lamar. RAP/SONG COLLABORATION: "The Monster," Eminem and Rihanna. RAP R&B: "i," Kendrick Lamar. R&B SONG: "Drunk in Love," Beyonce and Jay Z.
R&B PERFORMANCE: "Drunk in Love," Beyonce and Jay Z. URBAN CONTEMPORARY ALBUM: "Girl," Pharrell. R&B ALBUM: "Love, Marriage & Divorce," Toni Braxton and Babyface.